Usage/Application Amlopres 10 Tablet is used in the treatment of high blood pressure and chest pain (angina). Take this medicine in the dose and duration as advised by your doctor. Swallow it as a whole. Do not chew, crush or break it. 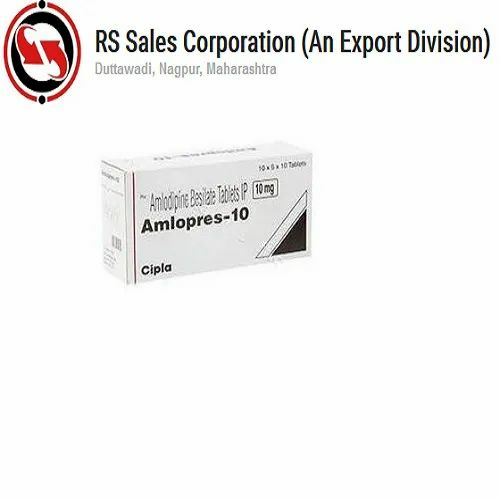 Amlopres 10 Tablet may be taken with or without food, but it is better to take it at a fixed time.Amlopres 10 Tablet is a calcium channel blocker. It works by relaxing blood vessels which makes the heart more efficient at pumping blood throughout the body. Established in the year 2017 at Nagpur, Maharashtra, we “RS Sales Corporation" are Partnership based firm, involved as the Exporter & Dropshipper of ED Medicines, Modafinil, Armodafinil, Sildenafil, Tadalafil, Verdenafil, Etizolam, Tramadol, Anti Cancer Drugs, Anti Depressant & Anti Anxiety Drugs, Anti Fungal Drugs, Anti Infective Drugs & Medicines, etc. All our products are getting widely acclaimed among the large clientele for their exclusive designs, superior quality, and reliability. Apart from this, our ability to maintain timelines as well as quality in the assortment, providing cost-effective solutions and assurance to make timely shipment of the orders placed by customers have assisted us positioning our name in the list of top-notch companies of the industry.